Today's prompt, chart your year. 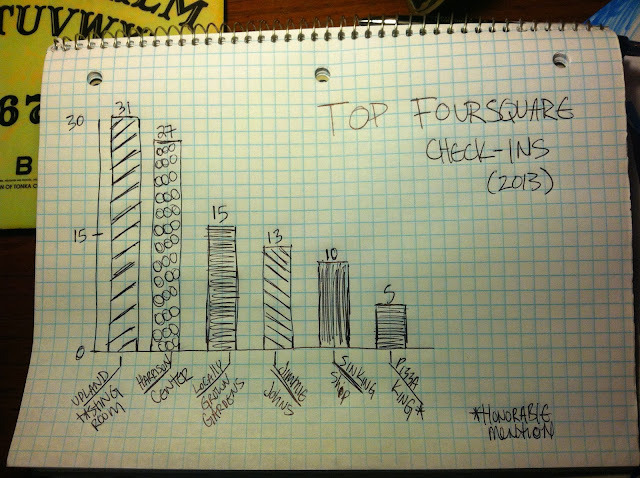 So, I pulled some of my stats from my Foursquare account and made this stellar bar chart. Speaking of bars, I don't have a drinking problem despite what this chart may imply. I have however, eaten my weight in Jimmie John's #6. Plus, east central Indiana Pizza Kings rule them all so I'm obliged to include these check-ins as an honorable mention. I'm such a good little consumer.